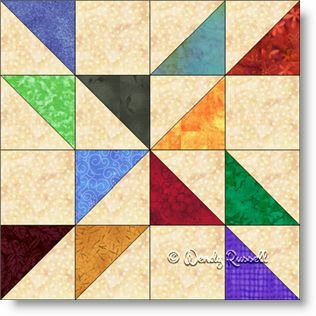 This four patch quilt block is an easy one to construct. It is sewn in four identical quadrants and those are then simply rotated. Half square triangles and squares are all that this block needs. I decided this is a perfect choice for a "scrappy" block -- using up all your little tidbits left over from other projects. But, it looks great as just a two colour block as well. Both of the quilts illustrated are made by setting the blocks on point but with subtle changes, they look entirely different. Now it is over to you to create a quilt for your favourite Sarah!